The goal of photosynthesis is to capture light energy from the sun and convert it into forms that are useful to the plant. The process begins in Photosystem II, where the light harvesting complex absorbs photons and relays that energy to the reaction centre, which can refer to a specific protein within photosystem II or, more specifically, to a pair of chlorophylls within that protein. What happens there? The first goal of photosynthesis is the production of ATP. As in oxidative phosphorylation, that task is accomplished by releasing energy through an electron transport chain. In general, electrons need to be transferred from a position of high energy (or low potential) to low energy (or high potential). Photoexcitation helps that process because it leads to the formation of a low-energy hole as well as a high-energy electron. Figure PS3.1. 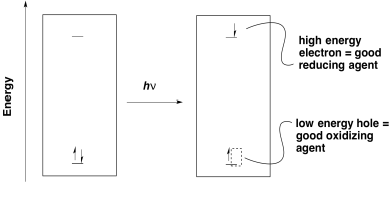 Electron hole-pair separation in photoredox processes. Once an electron has been excited, it finds itself at a much higher energy level. 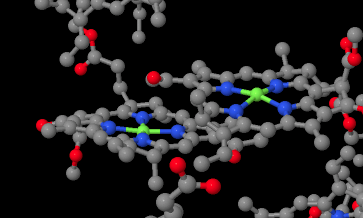 It can easily slide downhill to a lower energy acceptor orbital. 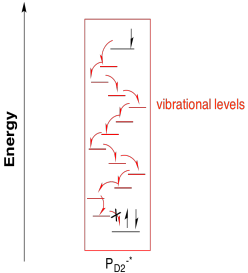 Note that the energy level of the acceptor orbital could be anywhere below the higher electronic level in the excited state. It could even be above the original electronic level in the ground state. That means that an electron transfer that would have been uphill if it occurred from the ground state would now be downhill from the excited state. Figure PS3.2. A ground state vs. excited state reductant. Furthermore, any donor that is above the original electronic level in energy could drop an electron into the new hole. Without photoexcitation, electron donation would be much more endothermic. Figure PS3.3. A ground state vs. excited state oxidant. The reaction centre is sometimes referred to as P680, for pigment 680, so called because it has a UV-Vis absorbance maximum at 680 nm. It could absorb visible light directly, but more likely it is excited by transfer of energy from the surrounding antennae molecules in the light-harvesting complex. The reaction centre is actually composed of two pairs of chlorophylls. One of these pairs sits very near together; they are parallel to each other and overlapping so closely that they are practically touching. This special pair is called the chlorophyll dimer, and each individual chlorphyll within the pair is sometimes given the abbreviation PD1 or PD2. These two special chlorophylls form an excitonic dimer. That means that the two molecules behave as if they were only one molecule during a photochemical event. When a photon is absorbed, or the equivalent amount of energy transferred from another molecule, the excitonic dimer enters into an excited state in which an electron has been passed from one chlorophyll to the other. Why would that happen, from a biological perspective? Maybe the electronic separation simply makes one half a better reducing agent (it is negative) and the other half a better oxidizing agent (it is positive). Alternatively, that separation of the electron and the hole between two different molecules could lead to a more efficient photoredox process by making relaxation a little more difficult. Certainly the excited electron could recombine with the hole via the same pathway by which it was formed, with transfer of energy back to a surrounding molecule. Other relaxation pathways are less likely, however. It would be unlikely for the P680-* half to relax via a simple cascade through vibrational states since the electron would find no hole to drop into on that molecule. Figure PS3.5. The pathway to relaxation of PD1-* via internal conversion is blocked by lack of a hole. Instead, the excited electron enters into an electron transport pathway. The electron is first transferred to a nearby chlorophyll a (ChlD1). From there, an immediate, rapid transfer to a pheophytin molecule follows. A pheophytin is really just a chlorophyll without a magnesium ion in the middle. a) with an oxygen-centred anion. b) with a nitrogen-centred anion. Based on the structures of the analogous chlorophyll a and chlorophyll b, which would be expected to have a more positive reduction potential: pheophytin a or pheophytin b? The subsequent destination in the electron transport chain is a plastoquinone. Like the related ubiquinones found in oxidative phosphorylation, plastoquinones are mobile, two-electron carriers. Mobile electron carriers are needed in order to transport electrons from one complex to another. The plastoquinones are also quite lipophilic, so their range of motion is restricted to the thylakoid membrane. That restriction boosts the efficiency of photosynthesis by making it unlikely for the transported electrons to be lost elsewhere in the cell. Show the product of the two-electron, two-proton reduction of plastoquinone (plastoquinol). There are actually two plastoquinones in the electron transport chain, however, and only the second one is mobile. The first one is covalently bound to the protein. The two plastoquinones have different reduction potentials, probably because of their environments, and so the first plastoquinone not only acts as a stepping stone to the second, but also allows for a more gradual loss of energy as the electrons rolls downhill. 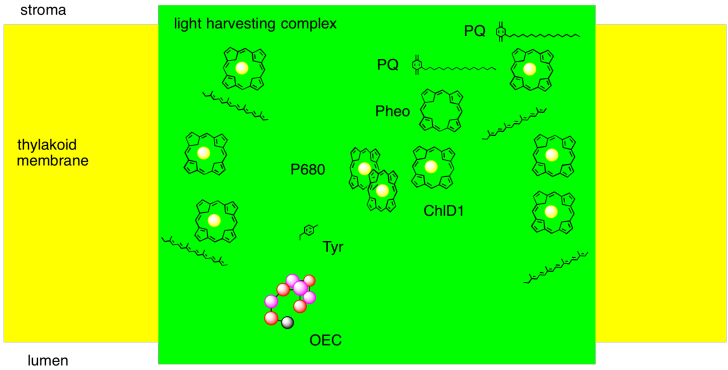 At this point, the second plastoquinol leaves photosystem II behind and travels to complex b6f, which will play an important role in ATP production via proton pumping. We are not quite finished with Photosystem II, though. What happened to that hole that was left behind in the excitonic dimer? PD2+* is pretty significant; it has been described as nature's most powerful oxidising agent. It needs to be: its job is ultimately to oxidise water to dioxygen. Remember, the opposite reaction, reduction of dioxygen to water, served as the final destination for electrons during oxidative phosphorylation. That exothermic half-reaction served as part of the driving force for the electron transport chain, the associated proton pumping, and ATP formation. To drive that reaction backward by stripping electrons from water will require a very strong oxidising agent. In fact, the reduction potential of PD2+* has been estimated at +1.3 V (vs SHE); that is quite positive. For comparison, the reduction potential of dioxygen under acidic conditions is +1.229 V (vs SHE). What is the reaction potential for the oxidation of water by PD2+*? In a sense, the reaction centre does not stand at the start of the electron transport chain at all. It is partway along; the real start of the electron transport chain is water. Electrons from water drop into the hole on PD2+*, forming a complete P680. The P680 absorbs a photon, sending the electron all the way up into PD1-*, and down they fall from there along the rest of the pathway. The reaction centre is like the engine on a ski lift or roller coaster, pulling in electrons and then sending them past to their next destination. There are actually a couple of intermediaries between PD2+* and the water, however. The nearest one is a tyrosine residue. It provides the electron that immediately replaces that which has been sent out of the reaction centre. Scheme PS3.1. Oxidation of tyrosine. The next intermediary is the oxygen-evolving complex. The oxygen evolving complex is a manganese oxo cluster that strips electrons from water while, at the same time, combining them to make dioxygen. We can summarise the events of photosystem II in a couple of ways. One way is to try to picture, roughly, how the different players involved so far are arranged in the protein complex. We can imagine how a photon is absorbed, and how that energy is passed along to the reaction centre. We can imagine a pathway for the electron through this system, too. Figure PS3.7. Simple diagram of some important elements of photosystem II. Alternatively, it is useful to display these components not in physical space, but in energy or potential space. By looking at the reduction potentials of the species, we can start to imagine how the electron transport chain works, and we can see more clearly the role played by light absorption. The absorbed photon lifts the electron up from a low energy level (corresponding roughly to the reduction potential of PD2+*) to a much higher one (corresponding to the reduction potential of PD1-*). Furthermore, we can understand another reason why the electron does not simply relax back to the ground state after the reaction centre becomes excited: the electron is quickly carried downhill through another pathway, involving transfer to other molecules. Figure PS3.8. Diagram of some important elements of photosystem II and their reduction potentials. The activity within photosystem II can be thought of as a catalytic cycle. Draw out the changes in electronic populations of the species below as a result of the sequence of events that starts with photon absorption. 1. X-ray crystal structures: Deisenhofer, J., Epp, O., Sinning, I., Michel, H. Crystallographic refinement at 2.3 A resolution and refined model of the photosynthetic reaction centre from Rhodopseudomonas viridis. J. Mol. Biol. 1995, 246, 429-457. Images obtained via RCSB Protein Data Bank (1PRC).